EDMONTON - Catholic bishops in Alberta and the Northwest Territories have apologized for abuse that aboriginal children suffered in residential schools. Edmonton Archbishop Richard Smith said Monday the group is the last one in the country representing Catholic bishops to make a public offer of regret. Others have issued formal apology letters as the Truth and Reconciliation Commission held events in their regions, he said. The commission is to hold its final national event in Edmonton next month. "We are adding our voice to those of the Catholic bishops and leaders of religious communities across Canada," Smith told several dozen junior high students at Edmonton's Ben Calf Robe School. "When people are hurt, you know it's important to say you're sorry." As president of the group, Smith apologized to those who experienced sexual and physical abuse at the schools, and expressed regret for separating children from their families and suppressing their culture and language. 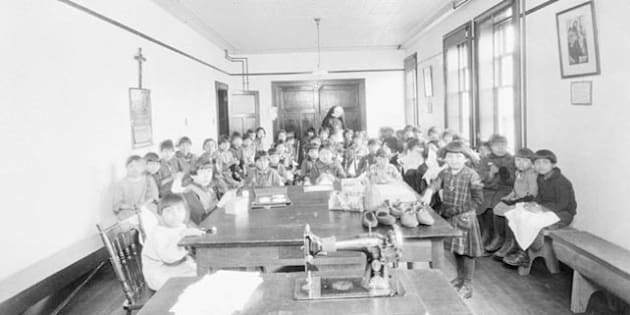 Alberta was home to more residential schools than any other province, including 15 that were operated by Catholic dioceses or religious congregations. The federal government started embracing the schools as a form of aboriginal education in the 1880s. They began closing about 60 years later, although the last school, outside Regina, closed in 1996. In 2009, Pope Benedict expressed his "sorrow" to a delegation from Canada's Assembly of First Nations over the abuse in schools run by the church. Prime Minister Stephen Harper apologized in the House of Commons a year earlier for the government's role in developing the schools. By that time, leaders with the Anglican, Presbyterian and United churches and Missionary Oblates had apologized for the schools they operated. The $60-million Truth and Reconciliation Commission is part of a landmark compensation deal between the federal government, the Crown and residential school survivors. It has visited hundreds of communities across the country, often hearing graphic details of trauma and abuse.